Retail sales and inflation news hit the wires. Last Week in Review: Retail sales and inflation news hit the wires. Forecast for the Week: Look for important housing and manufacturing reports in the middle of the week. Plus, the Fed meets! View: Time is money, so make your calendar work for you. Check out the simple tips below. "And now... the rest of the story." Paul Harvey. With his famous line, Paul Harvey pointed out for years that there's more to every story--and often those hidden details influence what happened. Read on to learn the big stories from last week, and the important details to note. 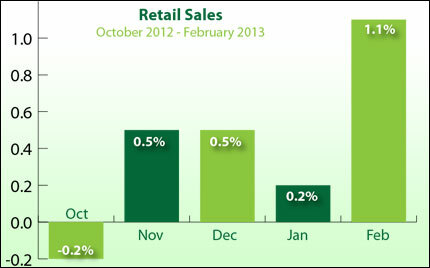 There was good news last week as retail sales increased 1.1% in February, up from 0.2% in January. This marked the biggest gain in the retail sales number in five months. In addition, the National Federation of Independent Businesses (NFIB) reported that its small-business confidence index inched higher in February. However, it is important to note that the NFIB's confidence index is still historically low and is below the lowest trough of the 1991-92 and 2001-02 recessions. The NFIB cited slow sales as the main problem. Inflation was another key story to note from last week. The Producer Price Index met expectations, showing that inflation at the wholesale level remains tame. However, the Consumer Price Index rose by 0.7% in February, coming in above the 0.5% expected. This was also a spike higher from the recent negative and flat numbers. However, inflation continues to remain within the Fed's target range. What does all of this mean for home loan rates? Good economic reports like the Retail Sales Report means investors are continuing to move money out of Bonds and into riskier assets like Stocks, to try to take advantage of gains. However, the Fed continues purchasing $85 billion in Bonds every month as part of their Bond purchase program known as Quantitative Easing. And the uncertainty in Europe continues, meaning some investors will likely continue their safe haven trade into our Bond Market. Overall, this should help keep Mortgage Bonds--and therefore home loan rates, which are tied to Mortgage Bonds--near record best levels. The bottom line is home loan rates remain near historic lows, meaning now is a great time to consider a home purchase or refinance. Let me know if I can answer any questions at all for you or your clients. The middle of the week is chock full of key reports, and all eyes will be on the Fed meeting. Important housing news will be released this week, beginning on Tuesday with Housing Starts and Building Permits. Existing Home Sales will also be reported on Thursday. Weekly Initial Jobless Claims will be released on Thursday. Last week's claims came in at 332,000, lower than estimates, but will this continue? Also on Thursday, the Philadelphia Fed Index will be released. Last week, the Empire State Manufacturing Index for March came in better than expected, so the markets will be watching to see if the March reading of the Philadelphia Fed Index will follow suit. In addition, the Federal Reserve will meet for its two-day meeting of the Federal Open Market Committee, with the monetary policy statement released on Wednesday. The statement will be dissected for any hints on the current purchase programs of Mortgage Backed and Treasury Securities. If there is any further talk of halting the programs this year, it could lead to lower Bond prices and a push higher in home loan rates. Remember: Weak economic news normally causes money to flow out of Stocks and into Bonds, helping Bonds and home loan rates improve, while strong economic news normally has the opposite result. 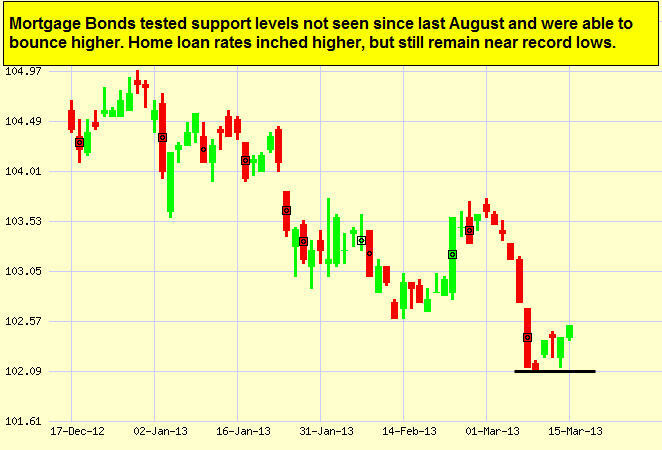 The chart below shows Mortgage Backed Securities (MBS), which are the type of Bond that home loan rates are based on. When you see these Bond prices moving higher, it means home loan rates are improving -- and when they are moving lower, home loan rates are getting worse. To go one step further -- a red "candle" means that MBS worsened during the day, while a green "candle" means MBS improved during the day. Depending on how dramatic the changes were on any given day, this can cause rate changes throughout the day, as well as on the rate sheets we start with each morning. As you can see in the chart below, Bonds were able to remain above a key support level, while home loan rates remain near record lows. I'll be watching closely to see what happens this week. If you find this helpful please let us know, just leave us a comment review. Just click Give A Review. A simple Thank You message means a lot to us. Christian Penner, Mortgage Broker West Palm Beach talks about Real Estate West Palm Beach. He also serves other Local Areas and provides home Mortgage Solutions for Palm Beach Gardens, Jupiter, Boca Raton, Wellington and Tequesta. Christian Penner Mortgage Broker Jupiter has the lowest mortgage rates and the best home mortgage programs like; Jumbo loans, FHA Home Loans, VA Home Loans, Reverse Mortgage Home Loans, Freddie Mac Home Loans, Fannie Mae Home Loans and HARP Mortgage Loans. Christian Penner Mortgage Broker Palm Beach Gardens has Served the area for over 15 years with his Home Loan Lending Needs and Works with FEMBI Mortgage in Jupiter. You Can Also Find Him On Facebook at: http://Facebook.com/YourMortgageBanker <-- ADD Me and Like My Page for more of this.